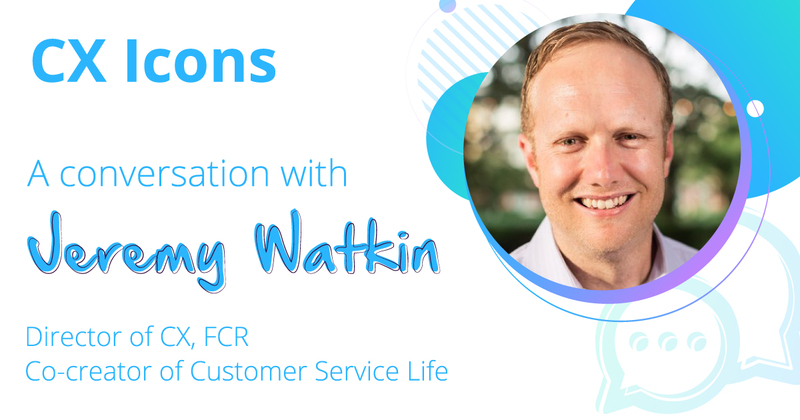 Jeremy Watkin is the Director of Customer Experience at FCR. He has more than 18 years of experience as a customer service, customer experience, and contact center professional. He’s also the co-founder and regular contributor on Customer Service Life. Jeremy has been recognized many times for his thought leadership. Follow him on Twitter and LinkedIn for more awesome customer service and experience insights. Would you mind telling us a little about how you got started in customer experience? Was it something you’d always been interested in or was it a happy twist of fate? I grew up in contact centers for SAAS startups speaking with customers and navigating the variety of issues that arise in that sort of environment. Inevitably we’d work through outages, bugs, and challenges with the overall user experience. I found that I truly enjoyed working with the other groups within the organization, whether it be engineering, marketing, or others, to ensure we were effectively listening to our customers and continuously improving our product. In all honesty, I still live in the contact center world and still consider myself a “customer service guy” at heart, but I always find that this work is a natural segue into the overall customer experience. Did I know I wanted to follow this career trajectory? Not a chance! But I always knew I could work well with people and help solve problems, and customer experience work certainly allows me do that. Your role involves working frequently with ‘frontline agents’… could you give us a little more insight into what that means on a daily basis, and where it fits into the wider CX puzzle? I have the privilege of working at an outsourcer which means I get to work with frontline agents for dozens of clients that span a variety of industries. Any time I engage with our frontline agents it’s a learning experience. Given that I also do a lot with quality assurance, I always approach this from a couple different angles. First of all, whether I’m speaking with agents in a round table setting, sitting side by side as they serve customers, or reviewing interactions for quality, I’m first listening for ways we can improve the service we provide. The second angle is that I’m constantly listening for those insights from customers and agents that will help our clients improve their customer experience. Any time I engage with our frontline agents it’s a learning experience. Employee Engagement is a phrase that crops up in conversations these days – how big a part does employee experience play in creating a strong CX culture? Admittedly, this one took me a little while to figure out but every employee must understand how their work touches customers — whether it’s directly or indirectly. When leaders begin to understand this, they start to see the impact of employee engagement on customer engagement. There are tons of things that impact employee engagement and it’s our job as leaders to eliminate as many of the obstacles as we possibly can. Do you have any advice for someone who is trying to promote a CX or VOC program in their organization? Any advice for pitching it to the ‘C-suite’? In my opinion there’s too much talk about CX and not enough doing. Before we start beating the drum let’s roll up our sleeves and be a part of the solution. This means that whatever your level in your organization, you can start improving the CX right now. If you’re a frontline agent, show up every day ready to make a difference. If you’re a programmer, seek out voice of customer feedback about your product to design the best experience possible. If you’re a manager, start listening to your customers and agents because they are already telling you how to improve. I’m a huge fan of a ground swell in organizations where folks realize that it’s both more fun and it’s better business to collaborate on a better customer experience. In my opinion there’s too much talk about CX and not enough doing. Before we start beating the drum let’s roll up our sleeves and be a part of the solution. Many businesses struggle when it comes to ‘actioning’ insights from customers – do you think the smaller details can be just as significant as big ‘initiatives’? In my world, we’re fairly familiar with customer surveys whether it’s CSAT, NPS, or CES. If you already have that data and are just tracking a score, you’re missing the boat. Take time to review the negative feedback from customers and correlate it back to the specific issue type(s). Once you’ve done that work you can then show the impact to key metrics by fixing certain issues, or adding certain features, or correcting certain frontline agent behaviors. This helps us be a bit more strategic about where we devote resources. Do you have any advice for someone struggling to prove the ROI of a CX program? I’ve been guilty of creating a CX/VOC program that consisted of a catchy title, colorful posters, and not much else. For any initiative to be successful it’s going to require buy in in your organization and it’s always going to require consistency and discipline to ensure that we don’t lose interest and move on to a new flavor next month. What are the latest trends in ‘Voice of the Customer’ technology that you currently find interesting? It’s a lot of work to sift through thousands of customer interactions to truly hear the voice of the customer. The combination of Natural Language Processing (NLP) to understand what customers are saying with appropriate comprehension and context, and Machine Learning to consistently bucket that feedback to understand key customer insights is incredibly exciting. Whether it’s speech and text analytics or tools that analyze customer survey responses, if they incorporate NLP and Machine Learning they become all the more useful. At TruRating we strive to provide businesses with feedback that truly represents the majority of a businesses customers – do you think that VOC programs can be skewed by extremes of opinion, be they overtly negative or positive? When reviewing voice of customer feedback it’s so natural to fixate too much on the negative and forget that there’s a lot we’re doing right as a business. On the other hand, it’s just as easy to lean more toward the positive and dismiss valuable feedback as being unfounded and off base. Neither approach is helpful and we must instead strive to find a balance. For example, if your customer satisfaction rating is 95%, be sure to celebrate the fact that you’re doing a great job the vast majority of the time. But be sure to dig into that other 5% and constantly look for ways to reduce that number through customer experience improvement. When reviewing voice of customer feedback it’s so natural to fixate too much on the negative and forget that there’s a lot we’re doing right as a business. Finally, and we’re being cruel here, what is the one most important reason that businesses should be focusing on CX today? I’ve more than once reminded some of my close friends in the industry that most businesses don’t focus on CX because it’s the right thing to do in an altruistic sense. Certainly there are organizations that serve a higher purpose, but by and large most organizations are chasing the almighty buck. Thankfully, it’s been proven over and over again that a great CX is great business and will yield great returns. It’s been fascinating to see traditional industries get completely disrupted by this fact. Hopefully you’re a part of a disruptor and not the disrupted. A HUGE thank you for taking the time to speak to us today! We mentioned it at the top but no harm in doing it once more here, for a regular sprinkling of CX wisdom, do follow Jeremy on Twitter and LinkedIn and make sure to follow the Customer Service Life blog.